Diwali, the Indian festival of lights is coming up soon and all sweet lovers prepare a galore of sweets to welcome this festival. No matter in which corner of the world you are, all Indians love to enjoy the vibe of this festival by either making sweets or at least buying them from Indian stores and of course lighting up fire crackers. While I was grating sweet potatoes, my kids were mused to try their hand on grating, but soon they gave up and wanted to see the end product. Once I was done making the burfi, my hubby peeked and checked if he can have a piece. I simply denied and said it needs overnight refrigeration. They had to satisfy their sweet tooth with some scraping those were left out in the pan and the spatula. 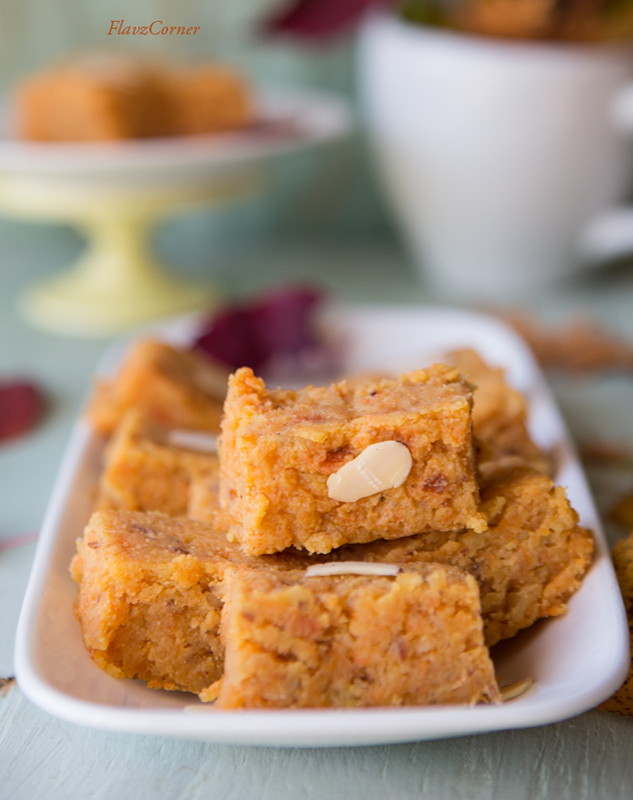 The burfi came out really firm and the nutty and chewy texture from the almonds made it so delectable that you cannot stop with one piece. My hubby gave me thumbs up for the burfi. Hope you will try this recipe for Diwali!! 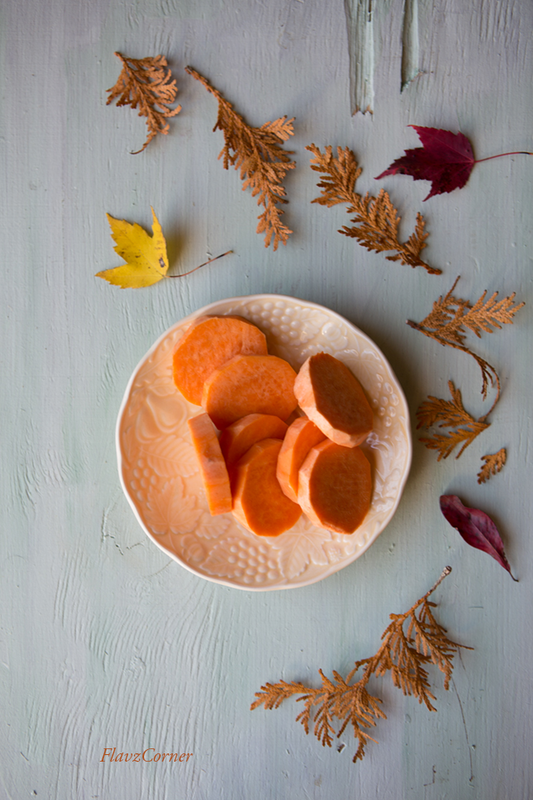 Wash and peel 2 medium sized sweet potatoes and grate them. Grating should be done just before you are ready to prepare the burfi to avoid any discoloration. Take a heavy bottom wide non-stick pan and melt 1 tbsp of ghee. Add the grated sweet potatoes and saute for 5 minutes on low to medium heat. 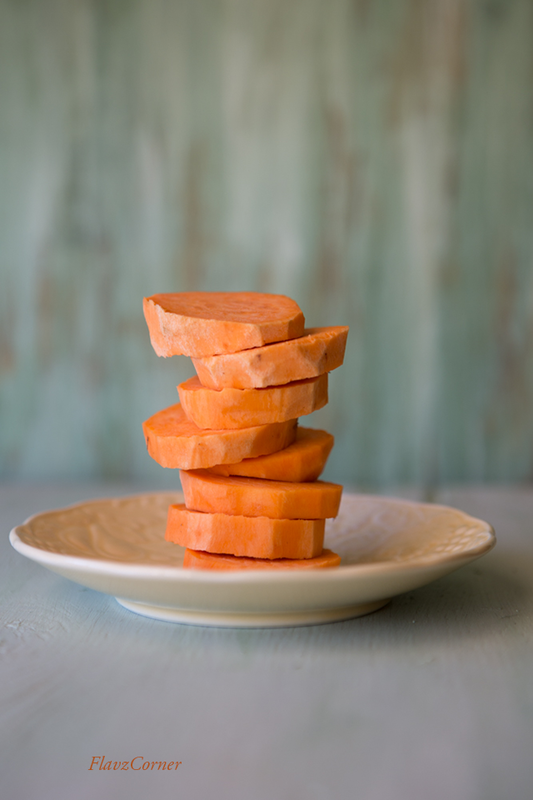 Now add the sugar, it will start to melt and coat on the cooked sweet potatoes. Now add the ricotta cheese and mix well so that there are no lumps, followed by 2 cups of milk powder. Keep the flame on low as it will start to splutter if the ricotta has too much moisture. Once all the ingredients are mixed well, add the crushed almonds. Continue stirring till the whole mix starts to leave the sides. In between add the rest of the ghee one spoon at a time. It took me 20 minutes to get the right consistency. Pinch a small piece from the burfi mix and try to form a ball and if stays tight, you can tun off the flame. Grease a glass container (pyrex) with ghee or line the container with wax paper with overhang on all four sides. Transfer the burfi mix to the prepared container and level the top using a wax paper or the bottom of a greased spoon. Leave it outside to cool down for 10 minutes. Close the lid of the container and refrigerate for overnight. 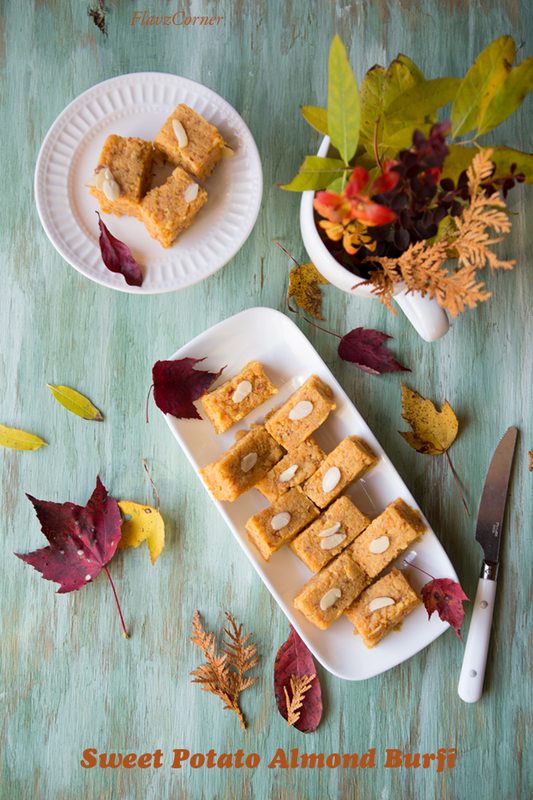 Once the burfi is set, cut them into desired shapes and top them with Almonds/Pistachios slices and enjoy! wow..this is definitely a delicious visual treat,Shibi dear...innovative and unique burfis with sweet potatoes,am sure the almonds and milk powder must have added the extra taste as well....yummmy!! 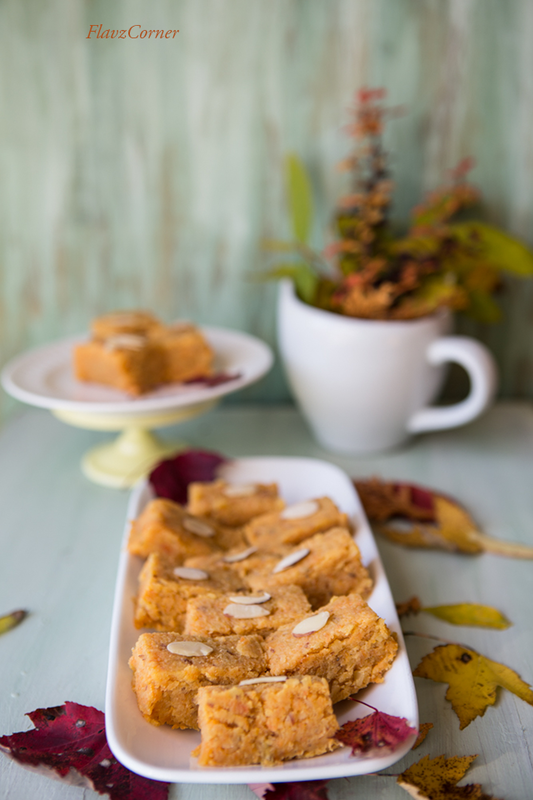 I have never had a burfi, but I am sure I would love these because they have my favourite sweet potato and almond! Awesooooome dish with awesome clicks.. I don't do fire crackers anymore, but when I was a kid I could never resist an opportunity to set them off. So I'd love Diwali! And would love this, too -- what a wonderful dish. Not something I've had before, but need to -- thanks!